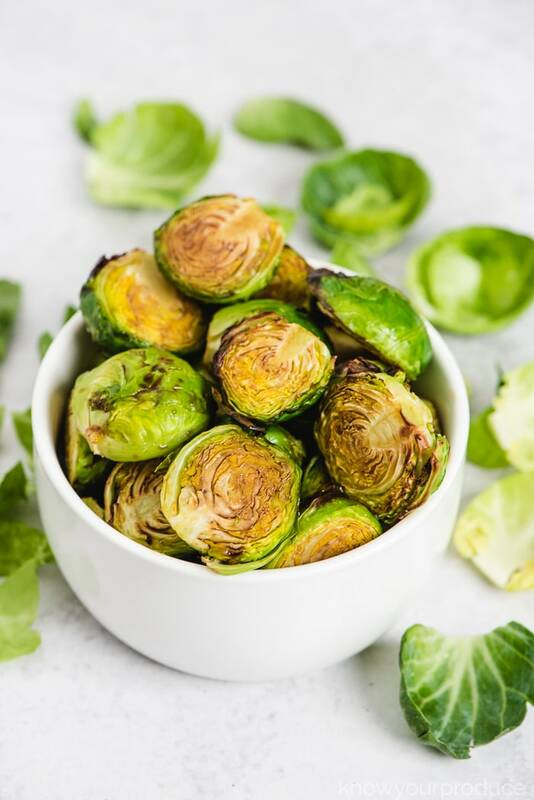 Tender and delicious Balsamic Roasted Brussels Sprouts make for an easy gluten-free and vegan side dish that is plant-based. If you like our Roasted Brussels Sprouts with Garlic you’re going to love these Balsamic Roasted Brussels Sprouts! We roast them with a few seasonings and then finish off with high-quality balsamic oil. 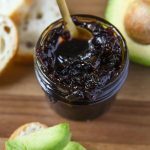 Love balsamic vinegar? 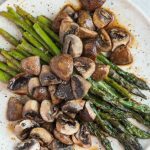 Then you must try our Roasted Asparagus and Mushrooms with Baslamic Vinegar – you could even make these two together on a sheet pan. We use some kosher salt and a little garlic powder. 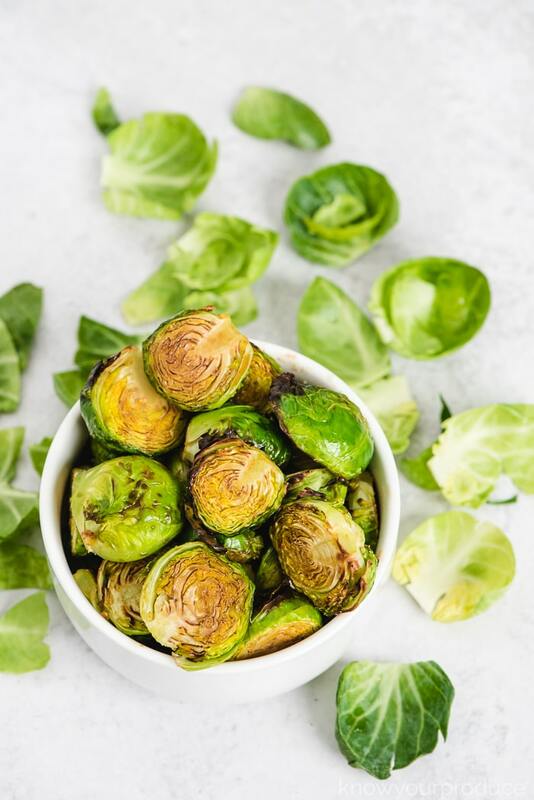 Place the Brussels Sprouts on a sheet pan and then mix with the seasonings and avocado oil. 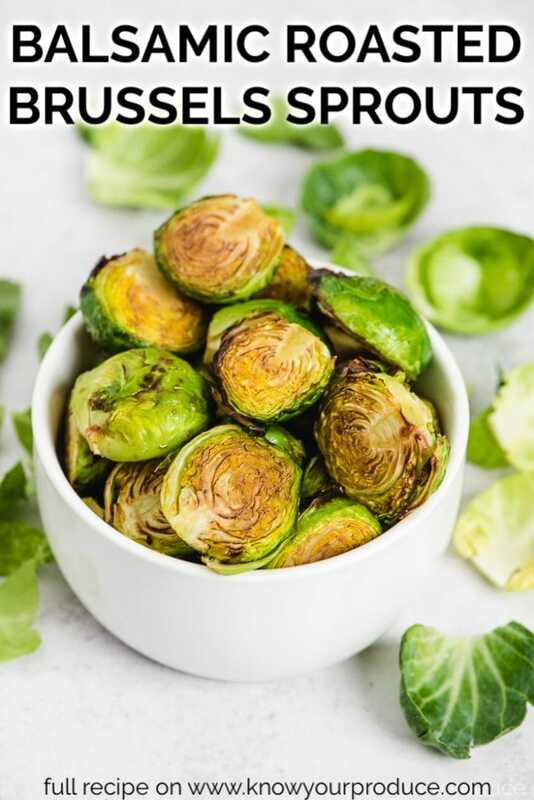 Roast the Brussels Sprouts until they’re slightly browned and tender, about 25 to 30 minutes, flipping once in between. 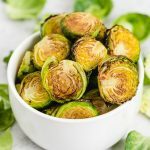 You can also make these as air fryer Brussels Sprouts and they’ll even cook quicker too. 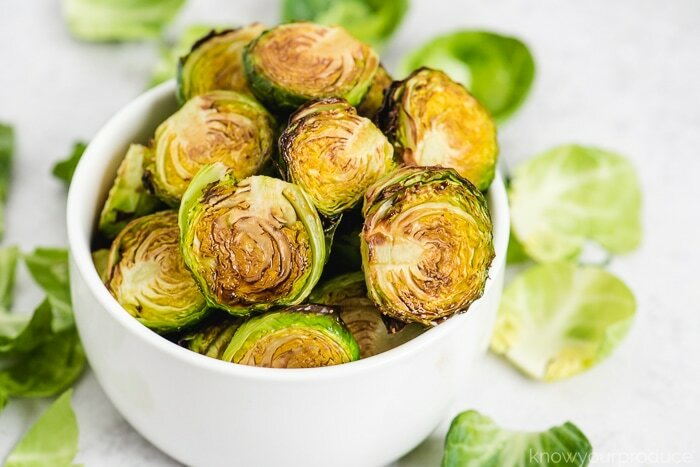 Toss the roasted Brussel sprouts with balsamic they’re done and enjoy! Absolutely! That being said, the frozen Brussels Sprouts may not get as crispy as they are waterlogged from freezing. You can still make delicious roasted vegetables using frozen veggies, but they may be a little mushier. 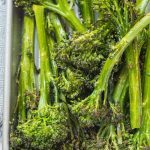 We highly recommend steaming your own and then freezing, like we do with our steamed broccoli. 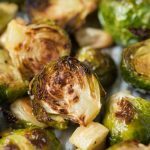 Can I use a balsamic glaze for Brussels Sprouts? If you want a thicker balsamic vinegar you can make a balsamic glaze which is just balsamic vinegar reduce on the stove at medium high heat. If you don’t like balsamic vinegar we also love tossing in some hot sauce. Some mix honey with the balsamic vinegar to add sweetness as well. Don’t be afraid to have fun with fruit too – it would go really well with this asparagus and strawberry side dish which also uses balsamic vinegar. We love making a double batch to make brussels sprouts pizza, just your favorite pizza dough or even try this dairy-free pizza. Add favorite cheese, top with the Brussels sprouts, a little garlic and you have a delicious pizza! Toss the Brussels sprouts in the vinegar after cooking, not before. Keep the seasonings minimal, the balsamic vinegar packs a ton of flavor. 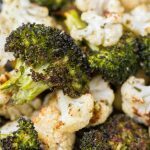 Add more veggies to bulk up this easy side dish like sweet potatoes, beets, cauliflower, mushrooms, or broccoli work well. 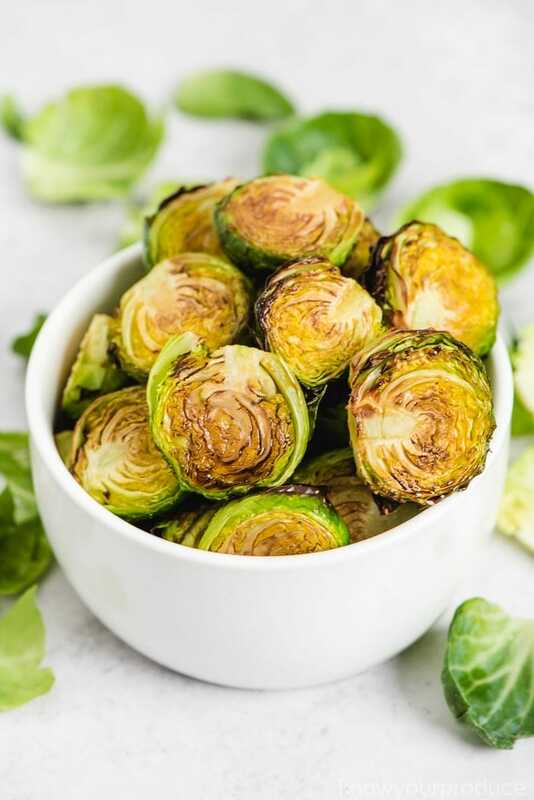 You can also make Brussels Sprouts in the air fryer, they will cook quicker than the regular oven. Want even more roasted vegetable recipes? Check out our post on how to roast vegetables for tons of easy roasted veggie side dishes. Wash the Brussels Sprouts and dry them off. Cut them in half and remove outer leaves that are loose. Place them right onto a baking sheet. Slice cloves of garlic and cut them into large pieces. Toss the Brussels sprouts and garlic with oil, salt, and garlic. Bake for 15 minutes and then give a shake to turn the sprouts and garlic. Cook for another 5-10 minutes to lightly browned, or 15-20 minutes for crispy. Toss the Brussels Sprouts with the balsamic vinegar and enjoy. Keep the garlic pieces whole or cut into large chunks, not too small. We do not want them to get crunchy and bitter. Don't overcrowd the baking sheet as the veggies will steam instead of crisp up. Don’t want to use the oven? 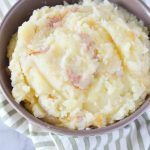 Follow the recipe and just cook them in a cast iron pan. It will crisp them up just as good as the oven.